FAST AND RELIABLE SERVICE FOR YOUR RENOVATION PROJECT OR A QUICK FIX, WE DO IT ALL! Founded in 1989, Downtown Lumber Home Building Centre is a dynamic firm that has been serving the needs of southern Ontario for over 25 years. We have developed a tradition of high standards of professionalism and our aim is to give our clients expert advice, quality products and exceptional service. We are proud of what Downtown Lumber Home Building Centre has accomplished over the years, but we are more excited about our future. 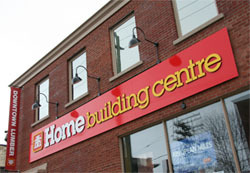 At Downtown Lumber Home Building Centre we are always striving to improve, looking for new ideas and be problem solvers. It is always our vision to be a leader by making a continuous effort to do everything to the best of our ability. We listen to our clients needs, wishes and desires, and give them the right products with the best prices and all the service required. From the start to the end Downtown Lumber Home Building Centre will be there for you, turning all your needs and dreams into reality. We will be the secret to your success! In the search of having the most complete service we are proud to announce that we offer an installation services. We thank you once again for visiting our web site and wish to extend our personal invitation to visit our modern showroom of ceramic tiles, bath and kitchen displays. Come and meet the staff at Downtown Lumber Home Building Centre and discover why thousands of satisfied clients recommend us to their closest friends and family.